On this page you will find a list of “go to” Christmas recipes, recipes that will make sure your holiday dinners are absolutely fabulous. You will find everything you need for a delicious Christmas dinner here, from the meat, to the side dishes, dessert and even a few drinks. When we think of wonderful holiday dinner recipes, the main attraction for most of us the meat. 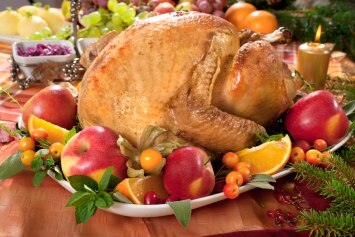 The most traditional meats for Christmas dinner are roasted – roast turkey, ham, prime rib or lamb. In our family it is always roast turkey with all the trimmings, plus a small ham for those non-turkey lovers. We have recipes here for all the holiday meats, along with their essential “go withs” and some tips and tricks. Who could imagine a turkey without a fantastic stuffing or great gravy? We have three delicious stuffing recipes for you to choose from. Plus there are instructions and tips for storing, cleaning and cooking the bird. Even a recipe for barbecuing the turkey – which gives it a great taste and REALLY frees up the kitchen. If you are cooking a ham or prime rib this holiday season, have a look at the beef rub recipes and ham glaze recipes below. They can make a real difference to the taste of your meat and sometimes offer an added taste surprise for guests. Every great meal includes fabulous side dish recipes. In this Christmas recipes collection we have them all, from traditional mashed potatoes and green bean casserole to something different like Harvard beets, glazed parsnips or French style peas. Look here to browse our full collection of vegetable recipes. Or type in what you are looking for in the search box near the top of the page. I am not sure why this is, but we all seem to have room for dessert – even after a gigantic holiday meal. The traditional Christmas dinner desserts in my family are apple pie and pumpkin pie. I have added pecan and lemon pie recipes here because I know they fit into other family’s traditions. And of course we have to include a delicious English trifle. If you want Christmas recipes for desserts and sweet treats in addition to the traditional pies, look here for a huge variety of Christmas baking recipes. Homemade eggnog is just SO much better than what you will find in any carton. Treat yourself to a batch (or several) this holiday season. And for those who aren’t fans of the nog, luscious hot chocolate. I hope these Christmas recipes add to the festivity of the season for you, your family and your friends. I wish you a happy and blessed Christmas.